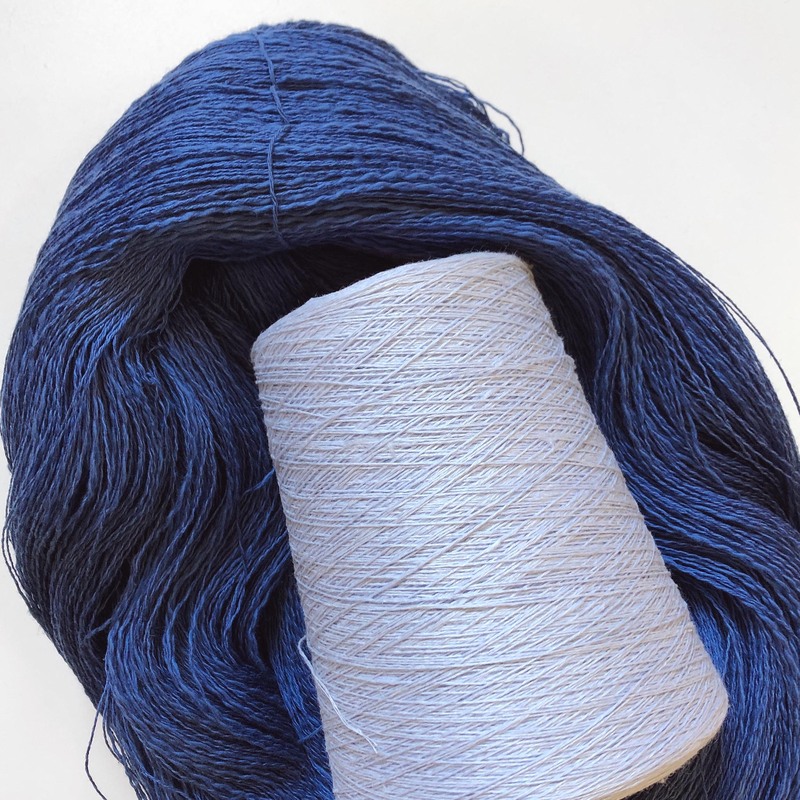 Melissa writes, "This project uses my two favorite Gist yarns, the Italian cotton linen weaving yarn, a glorious 50/50 blend of cotton and linen that brings out the best qualities of each, and the 100% linen weaving yarn. 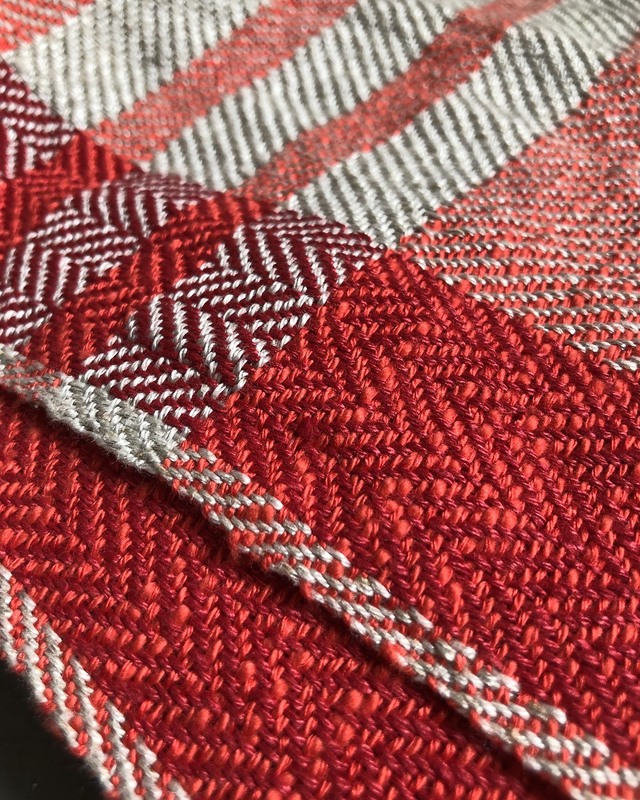 There is also a slight change to the threading across the stripe where it changes from 2-2 twill to a point twill, providing a bit of additional visual interest. 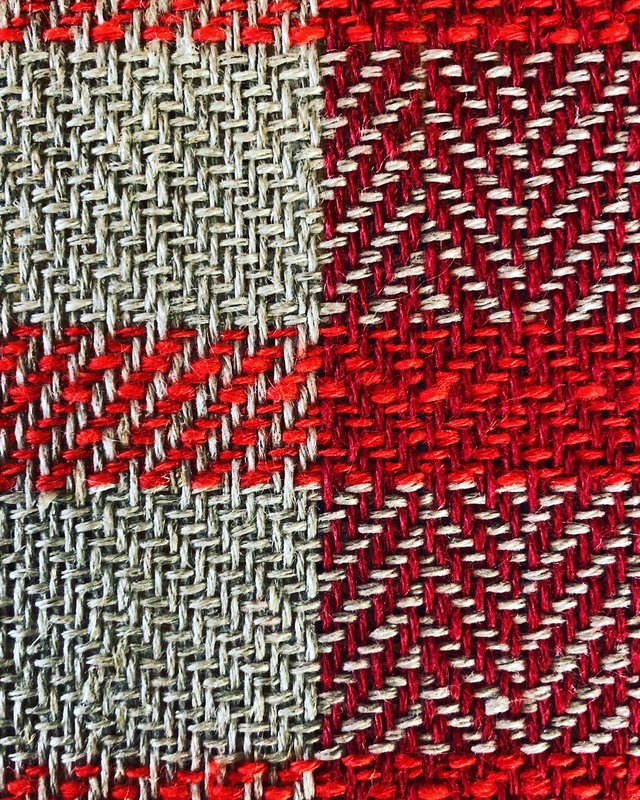 Finally, the twill changes direction when the three stripes are woven, which I think adds a bit of whimsy. Please note that the draft will guide you through the threading and weaving of the striped sections of the scarf, which in my version is only at one end. The remainder of the scarf is threaded and woven using a straight draw, 1-2-3-4 repeated." Warp Color Order: Warp the following sequence for a total of 344 ends. 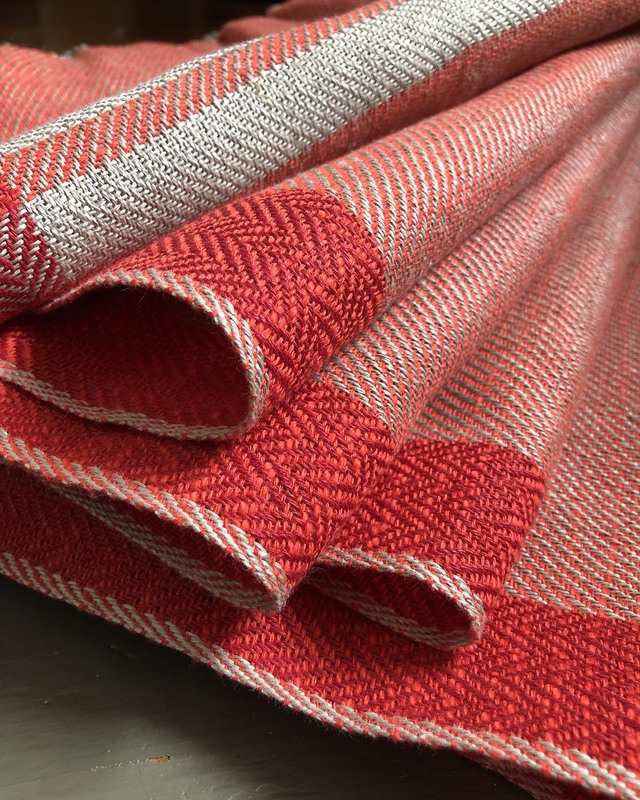 Melissa writes, "Since you are reversing the direction of your twill to weave the stripes, you will end up with an edge thread along each stripe that doesn’t get woven in. You have a couple of options. You can consider using floating selvedges, or you can go my route. I don’t bother with a floating selvedge. Instead I make sure to manually catch the threads with my shuttle as I’m weaving (two out of the four picks will require this). 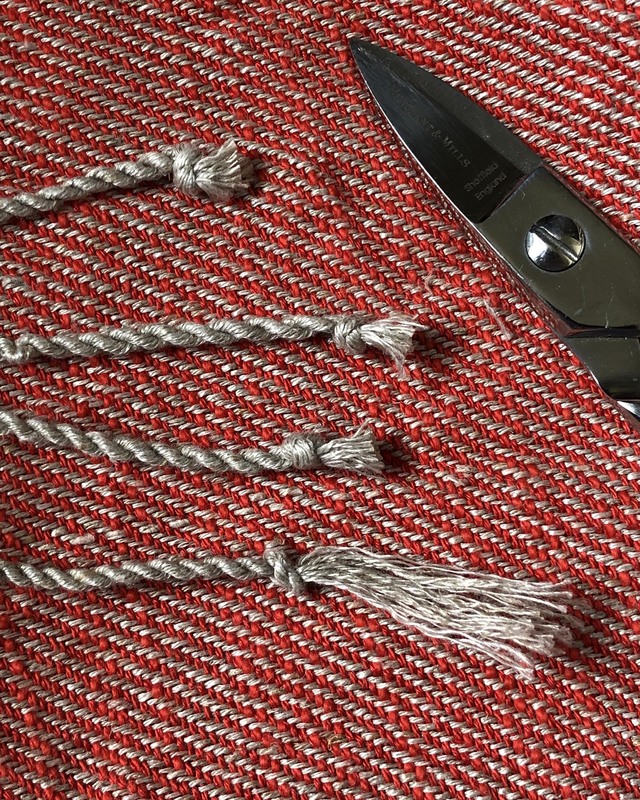 This slows the process down just a bit when you are weaving the stripes, but eliminates the need for a floating selvedge." 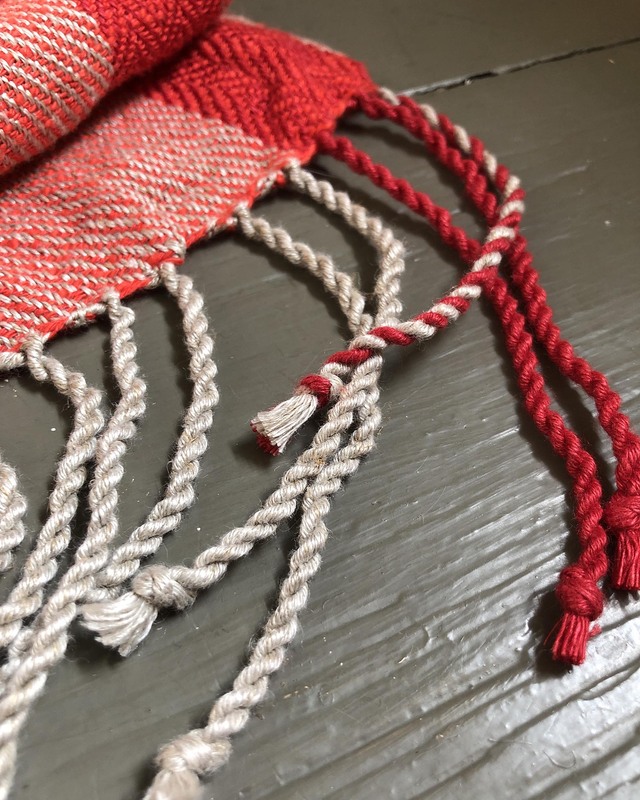 Melissa writes, "As you will be twisting your fringe to finish this project, I recommend tying your warp threads onto your front apron bar using a bow to secure instead of a second knot and leaving enough of a tail so that you will have at least 8” available to twist. Weave about 4” straight draft, 1-2-3-4 repeated. Each stripe reverses the twill and changes from the cotton/linen blend yarn to the 100% linen yarn. 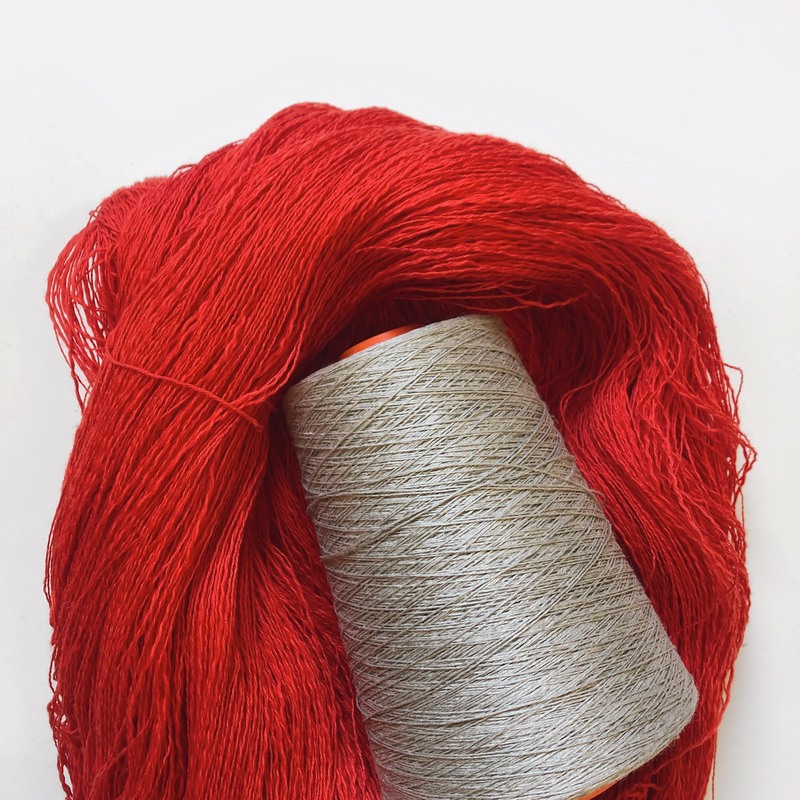 A reminder to catch your edge threads here when you reverse your treadling sequence. 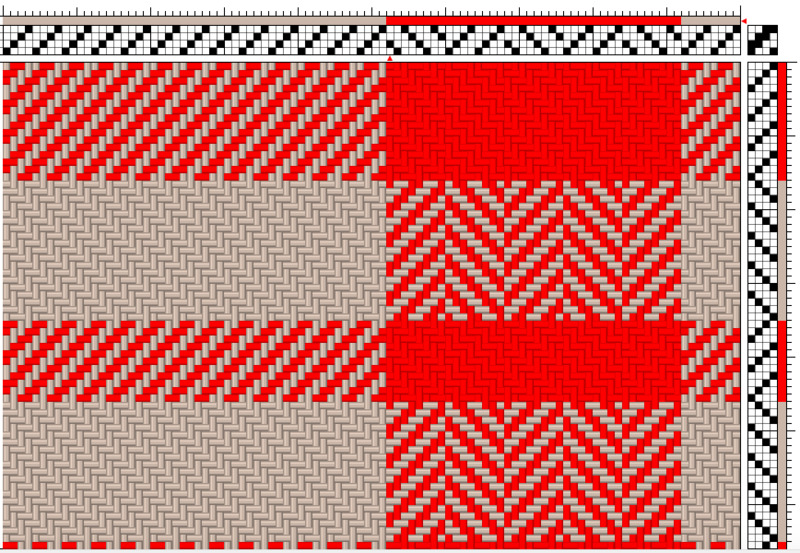 I used 19 picks for each stripe, with 11 picks of the cotton/linen between each. 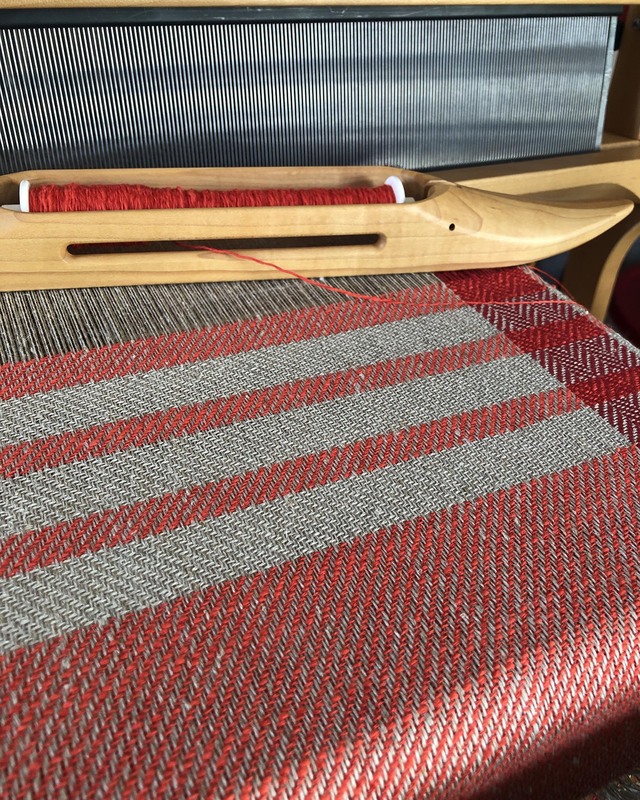 Once your stripes are woven, you can turn on the Gist Podcast and go back to your original treadling sequence for the remainder of your warp. I like to use as much of the material as possible, so when I get to the end of my warp and can no longer easily send my boat shuttle through the shed, I switch over to a stick shuttle. 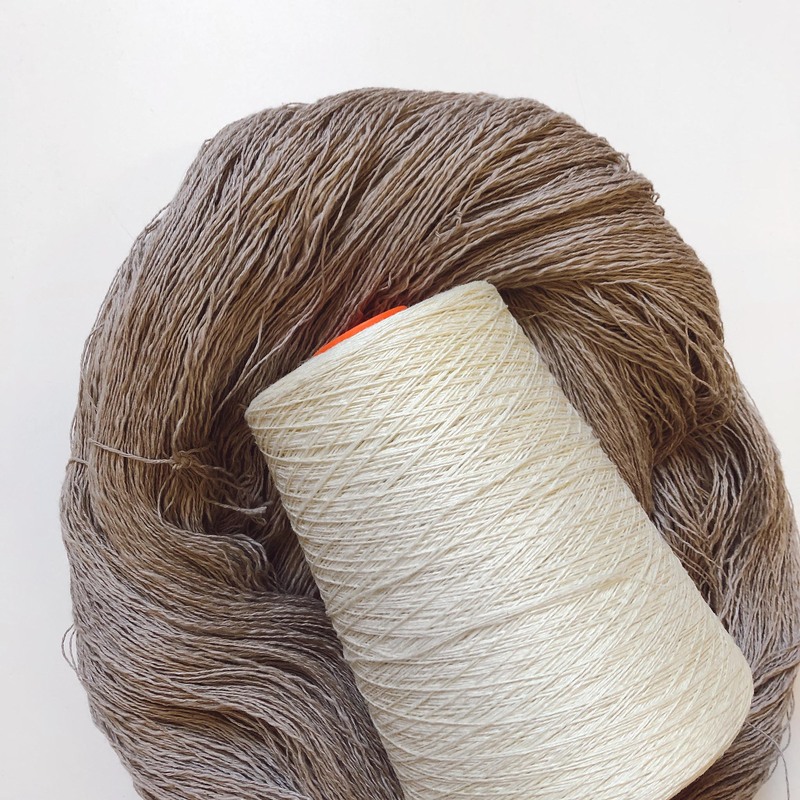 Be sure to leave enough unwoven warp so that you have at least 8” of threads available to twist your fringe. After weaving this scarf, I only had 5/8oz of loom waste. Not too shabby! When twisting linen into fringe, there are a couple of things to keep in mind. First, keep your bundles fairly small. I used 16 threads per twist – 8 for each half. Second, you want to twist this fringe a lot more than you would with other materials, as it has no elasticity. So over-twist away! Don’t worry if your fringe feels stiff. Once you wash your scarf, it will soften up a lot. Washing Instructions: While you can machine wash and dry your scarf, I like to hand wash and dry mine. If you air dry your scarf, you can pop it in the dryer on a regular setting for 10 minutes or so to soften it up." Melissa Hankens is a weaver based in Salem, Massachusetts. 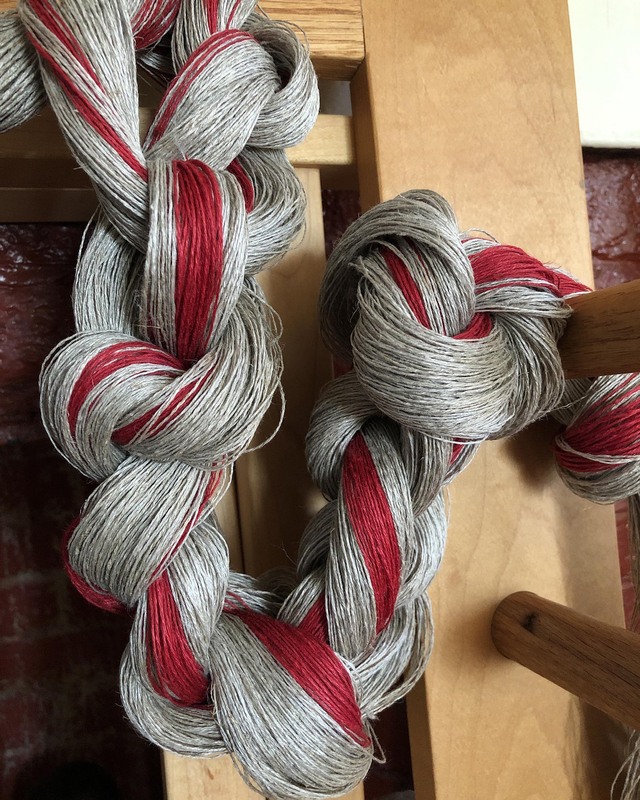 While she has been weaving professionally for over a decade, her career may have started one fateful Christmas long ago when, at the age of nine, she was gifted her first loom. 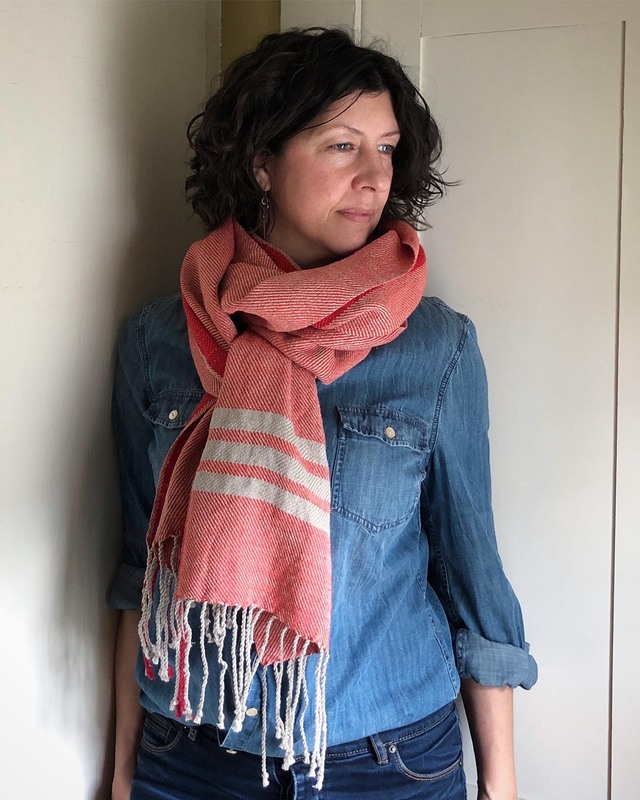 Melissa works extensively with natural fibers, primarily hemp, linen, and wool, to create beautiful and functional linens, blankets, and garments. She takes the idea of fewer, better things to heart with the creation of every piece, and loves to bring out the natural beauty of the materials she uses. Each seam is pressed in place and hand sewn, a process she feels gives her pieces heart and also pays homage to the way things used to be made: one at a time, with care, and meant to last. When she isn’t weaving (knitting, sewing, dyeing, or making jewelry), Melissa can be found either gardening or restoring her 18th century home with her husband and son.